Alexander Stroganov, namesake of this eponymous and celebrated dish,was born on January 11, 1796. A Monday. 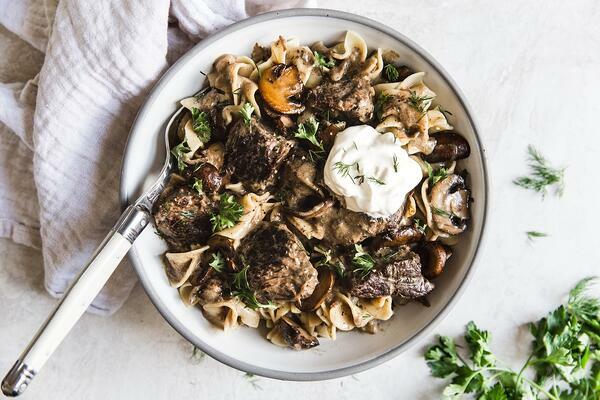 Now the origins of Beef Stroganoff are unclear, but it’s safe to say that Stroganov, statesman and diplomat, spend much of his life trying to keep the peace. Is it possible that this dish is a lasting gift from this brilliant man, the secret weapon in the endless war against Monday? We suggest you cook it and find out. Na zdorovie! Rinse and dry the English roast. Cut the meat into 2” pieces. Heat 1 tablespoon olive oil in a large skillet over medium-high heat. Add 1/3 of the meat to the hot pan and sear the meat on all sides. Add it to the crock pot. Repeat process until all the meat is in the crock pot. Deglaze the skillet by adding the white wine. When the wine has reduced to half the amount, add it to the crock pot. In a small bowl mix the cornstarch into the beef broth. Add it to the crockpot along with the worcestershire, dijon, dill, thyme and garlic. You can add the mushrooms at this point as well, or wait until the halfway cooking point. Depends on how soft you’d like them to be. Prepare the egg noodles according to the packaging directions. When the stroganoff has finished cooking, add the sour cream and stir to combine. Serve over drained egg noodles with parsley if desired.